I’m a little behind in posting, but on Monday evening, Husband Dearest said – let’s go check out The Gristmill – I hear the sunset is amazing. Now, Internet, there is something you have to realize about me – I have been 80 years old my entire life. My first instinct on a Monday evening is to be at home. Why? Duh – because it’s a school night. But then I realized something – I had no reason not to go. LIFE (The Next Chapter) has given me a gift of being in charge of my own schedule. So off we went. Gruene (“Green”) is such a fun, lovely place – the best of small town culture with historical route. This town very well could have had a “square”. People park – then people walk. Around town. Or, like us, to The Gristmill. Husband Dearest and I both had the Tomatillo Chicken, one of the healthier options. The meal was great, but the view and the people were what made this a place to come back to. One of the restaurant’s best assets is a lovely lady named Heather who went out of her way to know our names and make sure we had a great first Gristmill experience. The view is phenomenal – you’re sitting in the trees, watching the water flow down below as the sun bleeds all the best colors into the sky. Well, sue me for waxing poetic. Judge for yourself. 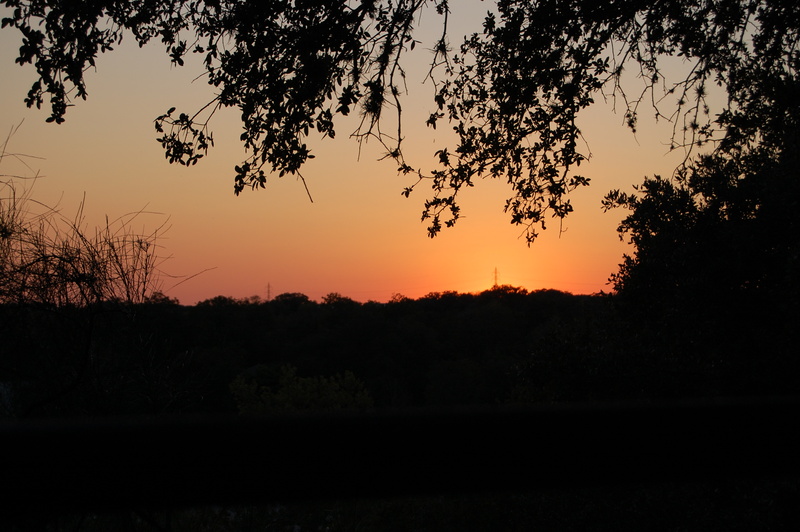 Sunset at The Gristmill is amazing. Thank you, Gristmill and thank you, Heather.